A month back, I was at the airport on the way home. And I had decided this time that I would not be carrying any book along. This one week at home is supposed to be spent with family and not with a book. And, guess what? I end up not only buying a book at the airport, but also spend the first two days at home glued to the book. Just had to. Have to admit, this is probably the first time that a book has been marketed so well that I just had to pick it up impulsively. A complete wall at the book store at the CSIA was branded with this latest offering from westland. A new author and I had not yet heard of the book, but the blurb on the backside just gave me in. I HAD TO READ THIS BOOK. 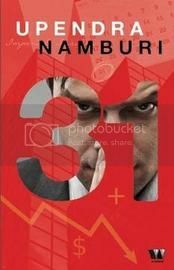 31 by Upendra Namburi. Have to say, the title of the book does build up curiosty. 31 stands for the 31 days in the month of March, and the book is neatly laid out with each chapter detailing each day of the month. Talking about the Story, the first few chapters are used in introducing the characters and the setting of the book. The protagonist is in a multinational Bank as a branch manager for south. He just completes February month on a high, and is all geared up for the last month of the financial year. Target achievements, appraisals, reviews and pressures – all of these sound so familiar. Ravi Shastri is your regular professional trying to make a mark in this big bad world. All the clichés – an over demanding boss, Difficult recessionary times, head count reduction, arrogant HR guy, an even more arrogant top management, ex-flame, wife, kids and parents and of course the Black berries and twiiter. Upendra ensures all of them are tied in complete tandem with the main story. One thing to be highlighted here is the way twitter is used in the main story to add continuation. The litmus test for any thriller is the ending and Upendra does a fair job. Speaking any more of the ending would rob you of the pleasure of reading the book, and thus I keep my mouth shut. Without doubt, do pick this up. One of the better Indian books that I have read this year.